FILE - White House staff secretary Rob Porter, right, walks with White House Chief of Staff John Kelly to board Marine One on the South Lawn as they leave the White House in Washington, Feb. 2, 2018. White House Chief of Staff John Kelly, under pressure to act, strengthened the process for security clearances for President Donald Trump's aides on Friday in response to a scandal involving a former official accused of domestic abuse by two ex-wives. Saying that recent events had exposed some "shortcomings," Kelly decreed that any interim security clearances for staffers whose background investigations have been pending since June 1 or before would be discontinued in a week. 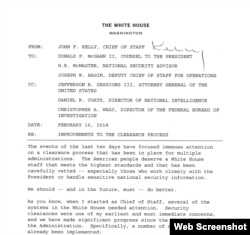 Chief of Staff John Kelly has proposed changes to the White House security clearance process. Dozens of officials, including Trump's son-in-law, Jared Kushner, are working under temporary clearances in the absence of final security clearance. The White House has yet to outline a clear timeline on who knew what and when about Porter's past, which includes accusations by his two former wives of domestic abuse.